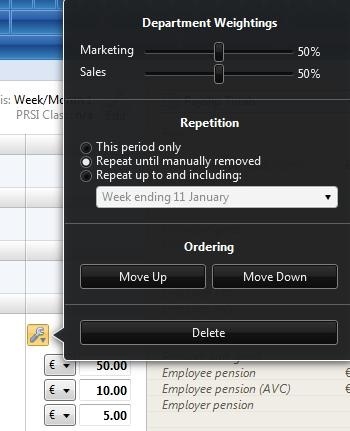 Click ‘Payroll’ on the menu bar and select the relevant employee’s name in the summary view. 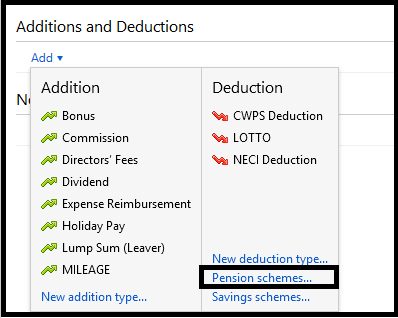 1) Within the ‘Additions & Deductions’ section on the employee’s payslip, click on ‘Add’ Under ‘Deduction’, then select 'Pension Schemes’ to add a new scheme. Pension deductions can be applied on a monetary value basis or on a percentage basis. Enter default contributions, selecting percentage or monetary values, the default rates can be changed within the 'Payroll' utility for any employee (s). If desired enter 'Contact and Payment details' > 'Save'. 3) The pension scheme will now appear in the ‘Additions & Deductions’ section. If required, the employee, employer and Additional Voluntary Contribution (AVC) values can be amended. To change the basis simply change the € sign to the % sign or the % sign to € sign and enter the applicable value. 4) To add further pensions, click on ‘Add’ again and repeat the process. 5) Should you wish to edit any pensions you have set up, simply click the ‘Edit’ button. Here you will find a facility to set a pension to repeat every pay period until you choose to manually remove it or to repeat up to and including a particular pay period in the future. 6) If you wish to re-order two or more additions/deductions you have set up, an ‘Ordering’ facility is also available here. 7) If you wish to delete the pension deduction, click ‘Delete'.